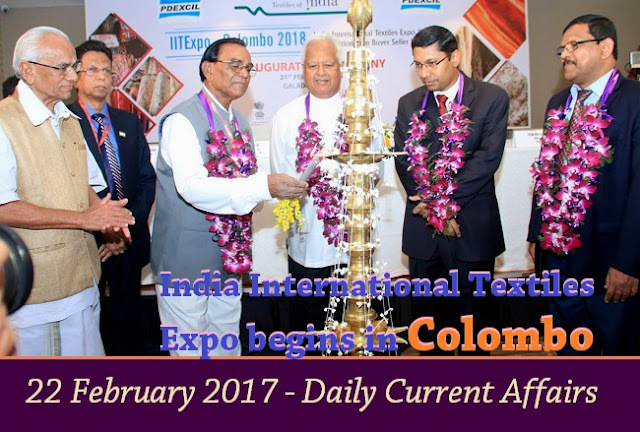 The India International Textiles Expo (IITExpo) - Colombo 2018-Exhibition has been inaugurated in Colombo, Sri Lanka. Three days IITExpo is being organized by Power-loom Development & Export Promotion Council (PDEXCIL) with the support of Union Ministry of Textiles & Ministry of Commerce & Industry. Around 45 exhibitors from various textile clusters of India are displaying the variety of fabrics made-ups, home textiles, traditional items etc suitable for apparel, industrial, technical application and general consumers. This would be a unique opportunity to see the products of reputed Indian textile companies under one roof. The Strategic Forces Command of the Indian Army successfully conducted night trial of its indigenously developed surface-to-surface nuclear capable Prithvi-II missile from the Integrated Test Range at Chandipur near Balasore in Odisha. The missile weighs about 4600 Kg, 9-meter-tall, capable of carrying 500 to one thousand kg of warheads. Prithvi-II inducted into the 333-missile regiment of the Indian Army in 2003. Prithvi-II is the first missile to have been developed by the DRDO under the Integrated Guided Missile Development Programme. The Employees’ Provident Fund Organisation (EPFO) has declared 8.55% interest rate for 2017-18 for its about 5 crores members. This was decided during the meeting of Central Board of Trustees of EPFO in New Delhi. Earlier, for 2016-17 the rate was 8.65% and 8.8% in 2015-16. The EPFO is an Organization tasked to assist the Central Board of Trustees, a statutory body formed by the Employees' Provident Fund and Miscellaneous Provisions Act, 1952 and is under the administrative control of the Ministry of Labour and Employment, Government of India. Flying officer ‘Avani Chaturvedi’ has become the first Indian women to fly a fighter aircraft solo. She flew a MiG-21 bison in her first solo sortie from Indian Air Force Jamnagar base in Gujarat. She is one of the three (other Bhawana Kanth & Mohana Singh) in the first batch of female pilots, who were inducted in Indian Air Force fighter squadron in 2016. The Mikoyan-Gurevich MiG-21 is a supersonic jet fighter and interceptor aircraft, designed by the Mikoyan-Gurevich Design Bureau in the Soviet Union. She completed her schooling from Deoland, in Shahdol district of Madhya Pradesh. In 2014, she Completed her bachelor’s in technology from Banasthali University, Rajasthan. She passed the Indian Air Force exam and completed her training at Hyderabad Air Force Academy. Veteran Tamil actor Kamal Haasan (63-year) has launched his political party ‘Makkal Neethi Maiyam’ (People's Justice Centre). The party's flag displays six joined hands altogether in alternate red and white colors with a white star at its centre in a black background besides a script saying ‘Makkal Needhi Maiyam’. Kamal was awarded the Kalaimamani award (in 1979), the Padma Shri (1990), the Padma Bhushan (2014) and the Ordre des Arts et des Lettres (Chevalier) in 2016. According to the Ministry of Development of North East Region (DoNER), the Union Government will set up the NITI Forum for Northeast to identify constraints and recommend suitable interventions for speedy and sustainable growth in the region. The forum will also review the development status in the region. The forum will be co-chaired by the Vice-Chairman of NITI Aayog Dr. Rajiv Kumar and Minister for DoNER Dr. Jitendra Singh. Christian evangelist Billy Graham (99-year) passed away at his home in North Carolina. He is credited with transforming American religious life through his preaching and activism. In 1983, President Reagan gave him the Presidential Medal of Freedom, America's highest civilian honor. Graham's reached people through his pioneering use of prime-time telecasts, network radio, daily newspaper columns, evangelistic feature films and globe-girdling satellite TV hookups. Norway's Marit Bjoergen (37-years) has become the most successful athlete in Winter Olympics history. She took bronze in Pyeongchang, South Korea in cross country skiing's women's team sprint free. Bjoergen's bronze with Maiken Caspersen Falla put her on 14 Olympic medals, outstripping fellow Norwegian Ole Einar Bjoerndalen who has 13 in biathlon. She is also the second most successful woman at either the Summer or Winter Games, trailing only Soviet gymnast Larisa Latynina who compiled 18 medals. Kikkan Randall and Jessica Diggins won the gold and the first Olympic cross-country title for the United States.